Amber beers don't excite you? Should they? Or should they simply satisfy you? I was looking for a beer to drink as an after work treat. I believe I found one in Crabtree Brewing's Serenity Amber Ale. Serenity is one of Crabtree's classic standards. It's been on tap at the brewery for years. Funny how something I've tried in the past can go unreviewed for so long, but I finally got my chance when I picked up a 6-pack this week when I was looking for something easy drinking for my own private happy hour. Serenity has a new label this year and is available in 12oz 6-packs for the first time. Previously only available in bombers. It weighed in at 6.1% ABV and at a noticeable 45 IBU, higher than most ambers. By design it was brewed to be unfiltered and slightly hoppy. It's also brewed right here in my own town of Greeley, Colorado. Appearance: Crabtree Serenity poured a dark amber color and had a very small off-white head. The beer was very cold so I wasn't surprised that the head wasn't bigger. I like to start a beer sampling cold and see how well holds as it warms up. Once the head disappeared, this brew almost looked identical to a Coca Cola in appearance only with a bit less bubbles and the ability to see right through it. For an unfiltered beer, this brew had clarity. It did have nice amber red edges around the glass. Aroma: Before the time I used to explore a lot of different craft beers I initially started drinking brown ales and ambers. This beer has all the wonderful aromas of rich malts and a touch of sweetness. Having a little more IBUs than most, I could also detect a slightly citrus and spice in the nose. This smelled like a good old classic amber with a bit of hop. Taste: Serenity has a true solid malty taste. It was only slightly sweet, light to medium bodied and had just enough bitterness throughout to balance the malt. I'm glad Crabtree decided to put in a few extra hops as this seemed to be the best mix for balancing out all the sweet malts. This brew was easy drinking, tasted clean and finished clean. This was a good whistle wetter, meaning, it didn't dry out my mouth, rather it hydrated it. Overall: The beer by itself was satisfying. It didn't blow my socks off, but then again it wasn't not supposed to. In my experience, most ambers taste a lot alike. Crabtree made this one stand up as well as all others. All too often I've found too many beers these days that try to be over the top with everything. It's nice to know that I can still find a beer that's made traditionally, without all the extra shock, yet worthy. Serenity was good and would just be right for just about any kind of occasion. This beer drank like a session, but with just enough ABV to sneak up on me at the end of the bottle. This brew would go well with most American food at either a lunch or dinner. I'd pair it more with red meat than with white meat. This could even go well with a hearty salad or even with a light dessert. 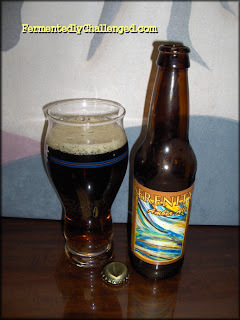 I enjoyed that Serenity gave me a clean and satisfying malty brew experience. I'd definitely get this one again. - Crabtree Boxcar Brown and Twisted Creek Wheat reviews. - Crabtree releases their Chunkin Pumpkin.